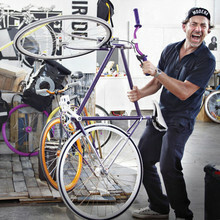 Setting off on a nine-day tour down the California coast on his custom-made bicycle, Grammy-award winning DJ/producer Benny Benassi is showcasing two of his greatest passions: cycling and music. Known for his worldwide smash “Satisfication” and his recent summer hit “Spaceship” with vocals by Kelis, he is well on his way to becoming an electro icon. Catch him at Ruby Skye on September 10th. SF Station (SFS): What made you decide to go on a bike tour? Benny Benassi (BB): It’s something I’ve wanted to do for ages. It unites my two passions: music and cycling. It’s fun, it’s a challenge, and it’s healthy! SFS: Why did you decide to be a DJ instead of the professional cyclist? BB: It’s just the way things turned out. People started paying me to put records on, and probably when I was eighteen I thought there’d be more girls in the discos than on the bike tracks. SFS: Tell us about your 5th studio album Spaceship. BB: Yes, I suppose it is my fifth album if you count the Benassi Bros. albums. I hadn’t been counting! As always, it’s a project with my producer and musician, Alle Benassi. We wanted to work with melody writers and singers from various genres. So there are R&B singers, rappers, pop-rock singers. We decided to give the album the same name as the first single. It’s a retro trick, a tribute to the ‘80s. SFS: Traveling all over the world, have you decided on a place to settle in? BB: I love the village I live in. It’s where I was brought up and where my family and friends are, in the north of Italy. I also love Lower Manhattan. SFS: With an influx of new DJs that seem to be coming out of nowhere and making it big faster and faster, how do you think you've managed to stay a favorite of many generations? BB: All I can say is that I still really enjoy what I do and I enjoy and connect with music produced by people half my age. As long as I am feeling that connection, I guess people find me relevant. The day I don’t connect is the day I retire. SFS: Is there a formula to this success? BB: I’m a lucky guy. I follow my instinct and my taste and try to be myself. None of it would have been possible without the "Benassi sound" and in that respect, my secret is Alle Benassi. SFS: How did you feel after the super hit "Satisfaction"? Do you feel differently about it now since it first came out? BB: Still love it. It’s come back to life thanks to the great remix from Afrojack. SFS: You've been coined the "Godfather of Electro." Do you like that term and would you change it to say, oh, "King/Your Majesty of Electro?" BB: How about "Chief Cyclist of Electro"? SFS: That has a nice ring to it. With all the headlining festivals you’ve done this year, what do you think has been contributing their bad reputation? BB: You mean, why are festivals getting a bad reputation? It’s so sad. Recently, there have been some tragedies, I know. It’s really bad and I feel for all the people involved. But often it’s a problem of bad organization. Really, really, 99 percent of the people are there to have a good time and behave responsibly and sensibly. And most festivals go off without any problems. Only that don’t make the news. SFS: What’s exciting you most on this bike tour? BB: The whole adventure is so exciting. I’m looking forward to the challenge and to meeting all kinds of people on the way. SFS: What are you looking forward to on your first stop here in San Francisco? BB: One of my favorite cities in the world! I’ll be training for a couple of days before we start off, so I’ll be getting a view from a bike. It’s great for cyclists.